Toward the end of summer, the seeds of many native plants in Maine begin to ripen and disperse, even some that bloomed back in the spring. People are often surprised to hear how much time can pass between when a plant flowers and when it sets its seeds. Some wild plants that bloom in early spring complete the seed-ripening process in less than two months; by now, those seeds are long gone. Other spring bloomers may not have ripe seeds until fall. Right now, summer- and fall-blooming plants are ripening seeds that will disperse and settle to the ground before winter. Observation is the key, noticing what the flowering stems look like after the show of flowers. For example, many of the meadow wildflowers transform into stalks of fluff ready to take to the wind after they have ripened. Seed ripening is most obvious with the deciduous trees, as many of them have nuts that fall profusely under the branches or helicopter-like seeds that spin to the ground. The acorns that fall from oaks and the keys that twirl from maple trees are examples of this. The colorful fruits of the native plums and cherries are also distinctive, especially when they fall to the ground and split, releasing a heady fragrance and attracting animals and insects. 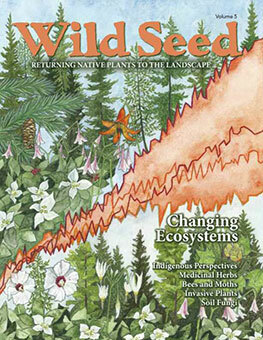 Try your hand at native seed dispersal—take notice of the fecundity around you, pick up some seeds from the ground, and plant them somewhere devoid of native plants. Here are seed collection and propagation tips for some of the native plants that are dispersing over the next month. Oaks: Collect acorns as soon as they fall (otherwise the squirrels will). Soak them overnight in a pail of water, discard the floating acorns, plant them immediately, and protect them from rodents with wire screens. Maple: The wings of the green keys take on a dry, papery appearance, while the seeds remain green. Collect and sow them immediately, and protect them from rodents, who relish the seeds. Ash: Fruits are long, thin keys with the seed at one end. They can be sown immediately or stored dry in the refrigerator until spring. Birch: Small, dry seeds with thin wings disperse gradually from the catkins all fall. Store the seeds in a paper bag until sowing. Viburnum, dogwood, and aronia: These shrubs and small trees have clusters of fleshy fruits. Remove the flesh and sow the seeds immediately. Wild rose: Pick the small tan-to-brown seeds out of the flesh. Sow in fall for the long, cold stratification needed for good germination. Witch hazel: Tan capsules ripen in October when the shiny black seeds explode from the pods. The pods can be collected before they open and stored in a paper bag. The seeds pop out, which is entertaining to hear if you are nearby. Milkweed: Canoe-shaped green pods turn from pale green to yellow and split along one edge. Pick the pods and put them in a paper bag to dry. Lobelia and penstemon: Dry, brown seed pods are filled with tiny brown seeds. Let them dry in paper bag before sowing. Iris: Large, brown seed pods split into three parts. Store the seeds dry for fall sowing. 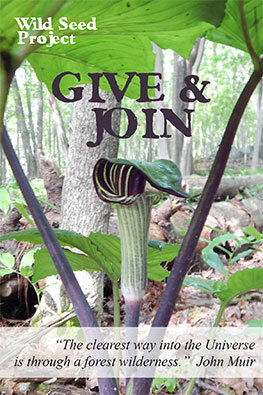 Jack in the pulpit: Clusters of red fruits on female plants are like beacons on the dark forest floor. Clean the flesh off the fruit and sow, or store dry in the refrigerator until spring. Canada mayflower, false Solomon’s seal, blue cohosh and Solomon’s seal: Harvest the fleshy fruits when they turn color (red or blue), remove the flesh, and sow immediately. Wintergreen and partridgeberry: Split open the red fruits and pick out the small seeds. Seeds can be stored dry until sowing. Coneflowers: Rub your fingers against the central cone and seeds will fleck off when they’re ripe. Store dry until sowing. Aster, Joe-Pye weed, blazing star, and goldenrod: Flowers turn to fluffy beige seed heads. Gently rub your hand across these fluffy clusters and ripened seeds will easily come off. Put the seeds in a paper bag and let them dry for a couple weeks to “after-ripen” (a wild plant strategy that prevents seeds from germinating in late-fall warm spells). Germination is most successful with fall sowing. 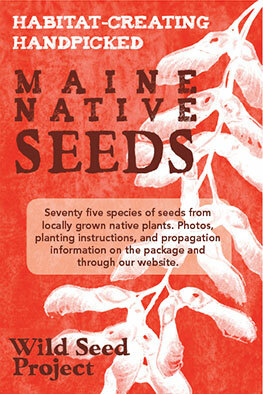 If you would like more information on native-plant seed sowing, visit our How to Grow Natives From Seeds page. For recommended propagation books, see our Books page.